HelioJET® has formed strategic alliances with key chemical suppliers in the industry in order to provide a comprehensive new technology program designed to prevent and remove system contamination. The program improves paper machine economics by maintaining the performance of the machine fabrics and the associated parts of the forming press and dryer section unit operations on a paper machine. The performance of the forming, press and dryer sections on a paper machine is critical in determining the financial competitiveness of a machine operation, because it impacts machine efficiency, energy usage and the quality of the finished sheet. Contaminants interfere with the paper machine operation of these units by reducing the ability of the fabrics to handle water in a consistent, uniform and effective manner and by causing sheet breaks due to build-up on rolls and vacuum elements. Paper machines that use recycled fiber are more susceptible to these issues, but this situation can also occur in virgin furnishes from pitch, starch and coating materials such as latex. For removal of paper machine contaminants when the deposit load exceeds the system's capacity to purge on its own, the application of mechanical action (e.g. high-pressure showering), high temperature water and the correct chemical cleaning agent will yield the optimum result, especially when these factors are combined. Thus, fabric properties and performance can be maintained over the clothing lifetime. This integrated approach effectively prevents and removes contaminants from the fabrics and paper machine surfaces in a safe and effective manner during production. 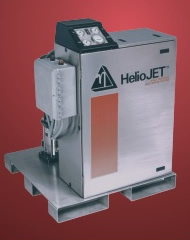 At the heart of all HelioJET® paper machine cleaning programs is the patented HelioJET® fixed flow unit. The unit produces high pressure hot water instantaneously at a 99% efficiency level. The equipment utilizes plant steam and water to achieve an output at up to 180 degrees Fahrenheit delivered to an overlapping fan shower up to 250 psi. To ensure consistent paper machine cleaning and chemical application across the felts, wires and dryer fabrics, HelioJET® implements automated internal brush showers to prevent nozzle plugging. The unit has virtually no moving parts, so this equates to lower maintenance and therefore, very minimal downtime if any. The paper machine solution offering is completely automated and is equipped with a fully customizable PLC and touch screen. The PLC allows customizing of all paper machine cleaning procedures, across all components of the offering. The PLC is programmed to operate on the HelioJET® unit, showers and chemical dosing pumps. This allows chemical personnel and/or paper mill operators to initiate a cleaning procedure, such as a full comprehensive dryer cleaning, at the push of a button. The chemical dosing program can be easily customized to deliver continuous, batch on the fly and batch down cleaning. Time intervals and dosing quantities can be changed via the touch screen to optimize cleaning. Shower Setup - Overlapping fan showers are positioned on the sheet side of the felt/wire 5 to 10 feet before the Uhle box, depending on space available. The angle of impact is set at 30 degrees into the run of the felt. This accomplishes three things; one, it acts as a "water doctor" by skiving off surface contaminants, two it penetrates the felt with up to ~180 degree hot water with the proper chemical program to loosen and make soluble/liquefy the contaminants to be removed via the uhle box and finally by angling the shower at 30 degrees, the majority of the water will deflected off so press felts are not over watered. The program offers improved runnabilty of paper machines by keeping machine clothing clean and open. This provides for better drainage which in turn provides a hotter sheet, with more solids and a more uniform moisture profile going into the dryer. The program has also proven to decrease energy usage in the dryer by providing a more uniform profile going into the dryer section. A key component of this offering is there are no capital expenditures required. HelioJET® has formed partnerships with key chemical suppliers to offer this comprehensive mechanical, chemical and operational package at a price per ton or price per month package. Unconditional guarantee - We're so sure of your positive results that if for any reason the program does not perform to expectations for any reason, the program stops at no further charge and the equipment is returned to HelioJET®. Typically wet end temperatures on a paper machine operate around 100 - 130° F.
With the HelioJET® chemical/hot water solution, the wet end operates in the 175 - 190° F range at shower point of impact. By elevating the temperature of the felt / wire to 175 - 190° F, the majority of contaminants will be melted or made pliable (see below). Contaminants can now be removed via the uhle box.